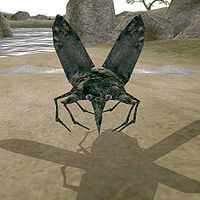 The mainland of Morrowind is home to several species of insect, from the beautiful to the deadly. 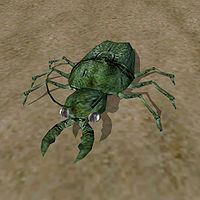 A full list of creatures can be found here. Beetles typically spend their time on the ground, but will take to the air to attack. They are found throughout the Boethian Mountains and are hostile on sight. Beetles may be infected with the disease Collywobbles. Harmless flying insects that appear in several sizes and colors. 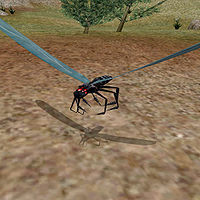 They are found all over the mainland, always hovering above the ground. 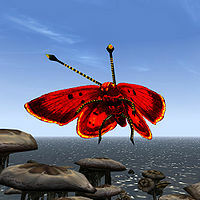 Flying insects that emit a buzzing noise as they move in to attack. 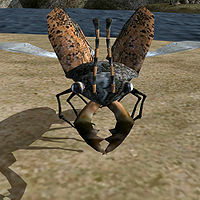 These creatures are almost harmless on their own, but can be very annoying in a swarm. 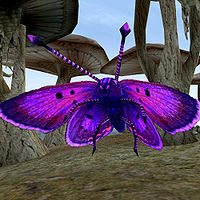 They are found almost exclusively in the Boethian Mountains Region, although the residents of Bal Oyra may disagree. Muskflies may be infected with the disease Ticklebritch. 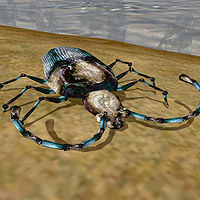 The Parastylus arguably stretches the definition of "insect", as it seems to have eight legs rather than the requisite six. 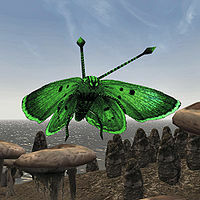 The front pair, however, seem to be more concerned with attack than locomotion and could be an evolutionary development along the lines of the Horned Beetle's horns. 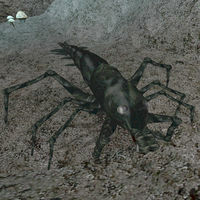 In any case, parastyli are rare, being found only in Jenigan Cave, Shasharanit and Manabilu Grotto. Diseased variants may infect their victims with Bonebreak Fever, Red Death or Red Rage; diseased venomous parastytli are also infected with Blood Lung. This page was last modified on 6 March 2019, at 07:56.